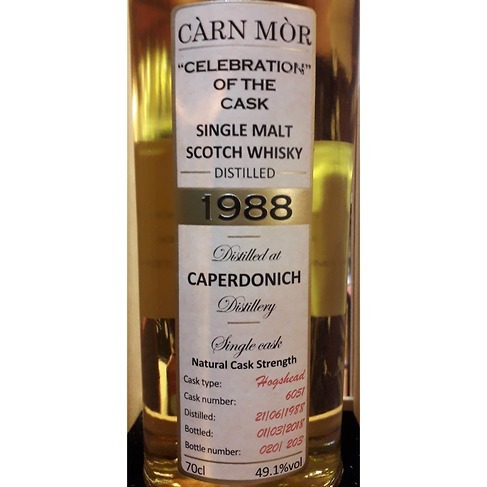 Carn Mor are, quite rightly, considered to be one of the best of the independent bottlers around, always managing to sniff out something rare and exceptional. As an off-shoot of Morrison & Mackay, Carn Mor do have access to some exceptional malt whiskies, but it is not solely limited to the Morrison & Mackay portfolio. Single casks bottlings, by their very nature, are one off's never to be repeated. It is fair to say that not every cask will be exceptional, with many falling into the 'distinctly average' category, however, some casks will stand head and shoulders above many of their siblings and deserve to have their moment of stardom! It is to this end that Carn Mor created the 'Celebration Of The Cask' range. Exceptional whiskies, bottled at cask strength, not chill filtered and not coloured up with caramel - just as nature intended. Each bottling is finite too, with some being as few as 180 bottles produced so you will need to be quick! 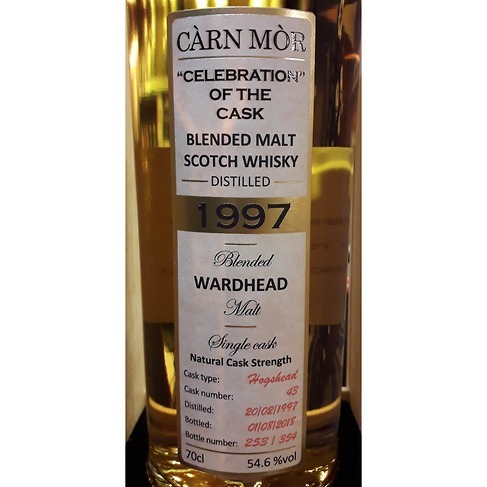 The good thing about the Carn Mor 'Celebration Of The Cask' range is that it is not exclusively single malt whisky, as we have a single grain whisky in the guise of Invergordon and we have a blended malt whisky called Wardhead. 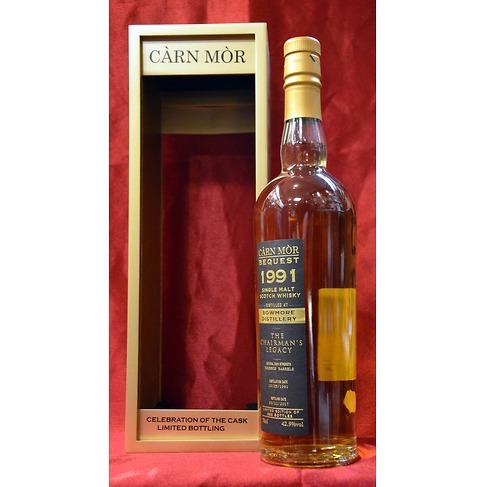 Bottled for the retirement of Brian Morrison Dist: May 1991 Btl: Nov 2017 Tasted: Dec 2017 Fresh and coastal with that classic mature, dusty peat character with hints of oily barley, violets, baked fruit, fresh vanilla and hints of sweet barley. Elegant and poised! Refill Sherry Hogshead 6051 Dist: Jun 1988 Btl: Mar 2018 Tasted: Mar 2018 The nose is very mature and malty with fragrant treacle and plenty of wood spice. Subtle notes of herbal Oloroso appear, but it's exceptionally clean and elegant for an old Caper! Late hints of heather and herbal spirit notes. The palate opens with slightly straw-like barley and vanilla with subtle treacle, dried fruit and grilled nuts. Lightly coffee'd tannins come through on the middle, but it's not too woody and like the nose, exceptionally clean. Long and juicy with herbal sherry, spirit, treacle, ginger, pepper and sub-Armagnac-esque notes. Refill Bourbon Hogshead 3208 Dist: Dec 1995 Btl: Jun 2018 Tasted: Jul 2018 A crisp, fresh, mineral and citric nose with aromatic white pear, grape, honey, violets and dusty oak. Wonderfully complex and deep. The emphasise here is definitely on the citrus and mineral note, thus making it intense and vibrant. Glenfiddich teaspooned with Balenvie Bourbon Hogshead 43 Dist: Feb 1997 Btl: Aug 2018 Tasted: Aug 2018 Intense but a little closed. Quite earthy and almost phenolic aromas with barley, minerals, subtle honey and buttery oak. The palate is like the nose a little closed but still intensely earthy with barley, minerals and oak. Masked but slightly juicy finish with lingering barley and pepper. With water the nose is crisper, fresher and classically minerally Glenffidich. The peated notes have disappeared and the oak is lessened, which allows the minerally white fruit, sugar coated orange and succulent vanilla to show. The palate is wonderfully juicy now and like the nose, crisper and fresher with white fruit, orange, honey and hints of creamy oak. Juicy and succulent with plenty of barley on the middle and a long, lightly coffee'd, peppery and milk chocolaty finish.